A bucket style bag with room for a rope and gear. It has foam padding in the sides so it sits up straight. When the rope is up on the route, you can use the bag as a padded seat or a clean spot to put on your shoes. Foam sides make a nice starting pad for bouldering. 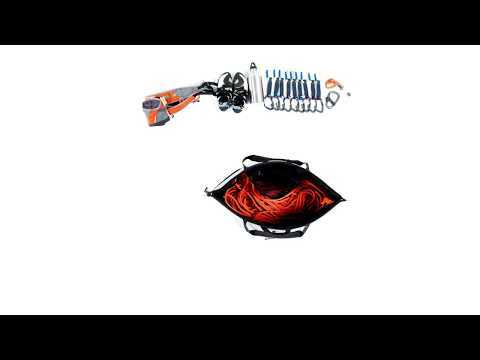 Drawstring system converts bag from rope bag to freestanding bucket for easy belaying. Large internal zippered pocket and strap keeps your climbing equipment organized. Colour-coded tie-in points to identify rope ends. Zip-top closure secures everything inside. Carry handle and shoulder strap for easy transport.